Makeup is one technique that can turn even the lowest of days upbeat. A simple swipe of blush and a pale face can have a healthy glow. It can give any person a gorgeous look. 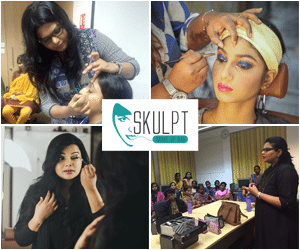 Just a few simple tricks and tips and a professional makeup class in Chennai helps to maintain your face like that of a supermodel. These tricks are also useful to learn the different types of makeups required for different places and occasions. For example, wearing loud makeup to a corporate office is a big no and wearing simple gloss to a wedding is a major faux pas. Here we give you ten do’s and don’ts that will make applying makeup easier and update your look. Makeup will be as good as the tools your use. Therefore, it is important to have all the right products and kits. A set of professional brushes will make a world of difference. Invest in them don’t buy cheap generic brushes. They will never give good coverage. Before you even apply the first layer, cleaning the skin is a must. No matter how professionally you apply makeup if there is a layer on your skin already, it will never look right. Clean your face with soap and then moisturise it. Give the skin time to absorb the moisture before you begin applying makeup. Blush is necessary. It gives you a healthy glow. The correct place to apply blush can be found out by bending over for about half minute and then coming back up. The point where your cheeks are flushed is where you should apply the blusher. Makeup is not an outfit. It does not need to be changed or worn all the time. You have to give your skin the room to breathe. No matter how clichéd this may sound it is vital to remember to go makeup free at times. Cosmetics have a shelf life. They should mandatorily be changed when they expire for example keeping mascara for more than three months is bad. It becomes dry as time passes which when applied to the lashes can cause them to look short and clumpy. Not every product that is made is perfect for your skin. Each skin type is different. Look for cosmetics that work with your skin type. The concealer and foundation should match in the shade not only with each other but also with the skin tone. This is crucial else the spots where concealer is applied will shine like a beacon giving you a spotty look. Makeup takes the time to be applied. Only a true professional can apply makeup in minutes and come out looking flawless. So never hurry. Take your time to apply it. Less is better. The issue with makeup is if you overdo it you have to remove the entire things and start all over again. You can just wash part of it. Therefore, instead of overdoing, apply less. If at the end you feel something is missing add on to that part. Makeup should make you feel good. It gives you confidence. It is not meant to make you feel awkward. So, use it and apply it as you feel right and not what others tell you.